Gina’s training in all aspects of hatha yoga and meditation is extensive, beginning in 1999 with her first yoga certification program with Atlanta Yoga Fellowship/Peachtree Yoga Center under the mentorship of Graham Fowler and Elizabeth Nix. Her subsequent training in Anusara yoga, over 1,000 hours, beginning in 2000, greatly advanced her asana practice and knowledge in biomechanics, methodical alignment principles, therapeutics, and Tantric yoga philosophy. 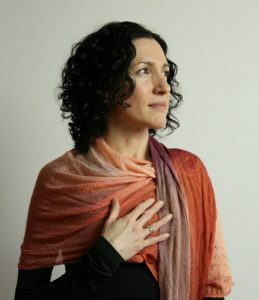 In 2006, she became the first certified Anusara Yoga teacher in Georgia, and was a pioneer for the growth of this innovative hatha yoga school in Atlanta and the region. Though she resigned her license with Anusara, Inc. in 2012, she continues to draw deeply from the efficacy and potency of Anusara methodology. Additionally, she began a regular meditation practice in 2000. In 2009, she became a student of renowned scholar and meditation teacher Prof. Paul Muller-Ortega, PhD, founder of Blue Throat Yoga, a school of sadhana in the Shaivite Tantric tradition. After many years of devoted study and practice, she is now an Authorized Teacher of Neelakantha Meditation as Taught in Blue Throat Yoga. With mystical experiences from childhood and with an avid interest in spirituality as an early teenager, she found her home in yoga in her early 20s. Tantric yoga philosophy and practice ultimately resonated most deeply with its life-embracing, life-enhancing, and life-expanding orientation. She delights in the continual discovery of the parallels between the myriad mystical and wisdom traditions, and particularly resonates with the Celtic reverence for the cycles of nature and Jesus’ real-life parallel transformation into the Christ. She also grounds her body and mind in attunement with the consciousness in nature through a growing dedication to Ayurveda, having completed Cate Stillman’s 9-month Living Ayurveda course in 2013. More recently, she is delving into the crossroads between yoga and psychology, both for herself and as a teacher of yoga, under the mentorship of Livia Cohen-Shapiro, becoming one of the first Affiliated Teachers with Applied Psychology for Yogis. Gina holds a degree in Romance Languages from the University of Georgia, with a minor in philosophy. She is also a Reiki Master and learned Thai Yoga Therapy from Saul David Raye in 2001, arts she no longer practices but whose studies inform her present day offerings. An E-RYT 500 with Yoga Alliance, she is senior teacher at Yoga Collective in Atlanta, GA, where she leads the BODY of LIGHT Yoga Immersion and Teacher Training along with public classes, private sessions, and workshops. As well she offers workshops regionally and nationally, and has presented at Atlanta Yoga Conference, Southeast Yoga Conference, Atlanta Women’s Foundation Yogathon, Dirty South Yoga Fest, and Mahabhuta Yoga Festival. Gina is a two-time lululemon ambassador, and a leader in the Atlanta yoga community. When not on the yoga mat or in the meditation seat, she enjoys her delightful teenage son, the bliss of nature, rocking out to U2, and rubbing the soft, sweet heads of her two pet house rabbits. See her Mission & Vision here.